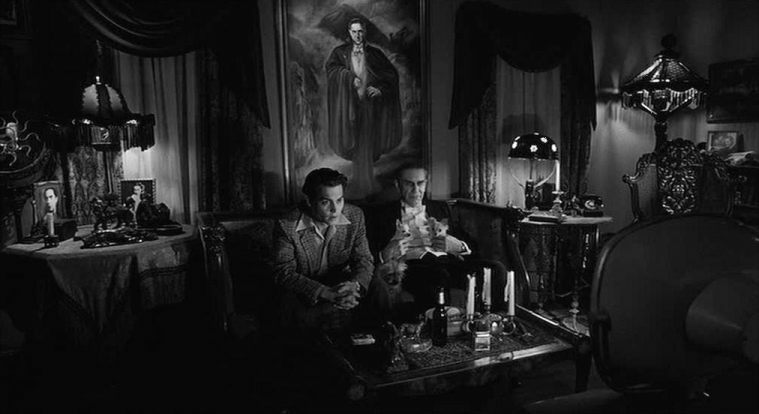 Ed Wood (1994); directed by Tim Burton; written by Scott Alexander and Larry Karaszewski, based on the book Nightmare of Ecstasy by Rudolph Grey; produced by Tim Burton and Denise Di Novi; music by Howard Shore; cinematography by Stefan Czapsky; editing by Chris Lebenzon; distributed by Touchstone Pictures; Awards: Best Supporting Actor: Martin Landau; Best Make-Up: Rick Baker, Ve Neill, Yolanda Toussieng; for a full list of awards and nominations, go here. From the sublime to the ridiculous. 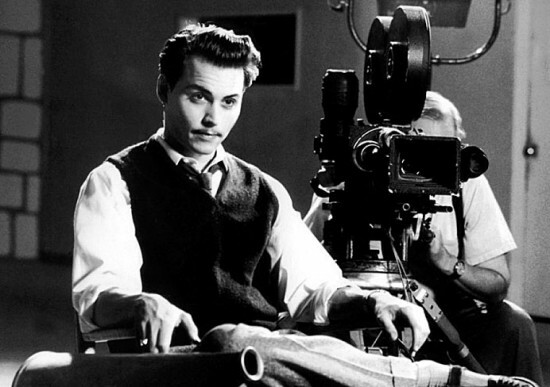 Ed Wood (1924-1978) directed some of the most inept films ever to grace television broadcasts. If you grew up in the Sixties and early Seventies, as Tim Burton did, you probably saw some of them on the “schlock-shock theaters” that showed B-grade and below movies as Saturday matinees and late night insomniac broadcasts. Wood’s films—the most famous is Plan Nine from Outer Space (1956), the most notorious is Glen or Glenda (1953)—were so spectacularly silly that they attained cult status and drew kudos from those who loved to mock them. Wood, we might suppose, is an unlikely subject for a biopic, though we might also imagine that such a film, if playing it straight, might contain some pathos, as there is perhaps none so sad as he who thinks he’s great, and isn’t. Tim Burton’s film is not the life of Wood; it is a stylized treatment of Wood (Johnny Depp) that draws upon some of the DIY auteur’s cinematic style to deliver a portrait of a kind that an Andy Warhol would understand: an imitation, a pop-fantasy, a paean to kitsch and cliché and visionary incompetence. Shot in black and white, with a great score by Howard Shore, the film is one of Burton’s most unique; it’s also fairly brave of him, and dates from the era before his long slide into bad revisions from other sources that began just after the turn of the century (Planet of the Apes, Alice in Wonderland, Dark Shadows, etc). 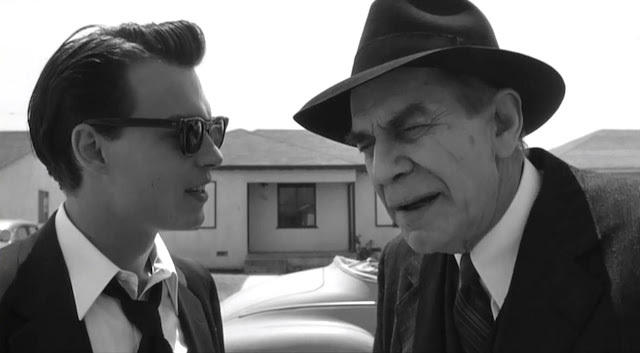 Ed Wood is a film about loving films, no matter how bad they are, and Burton’s loving recreations of Wood’s methods are priceless—as when we watch Béla Lugosi (Martin Landau), then Tor Johnson (George “The Animal” Steele) walk across a flimsy set, making the same gestures to mime grief, and responding to Wood’s prompt: “You want to keep moving. You have to get through that door.” Johnson almost doesn’t get through the door, colliding with the wall and making the set shake. That shot remains in Wood’s film. And the sequence of Lugosi wrestling a fake octopus with no motor is top notch, as is Ed and Béla watching a Creature Feature together on Halloween. Wood, as played by Johnny Depp, is the ultimate naif, and Depp makes all of his character’s oddity likeable and homey. Wood liked to wear women’s clothing, finding comfort in the textures, particularly angora, and one scene where he reveals his predilection to his girlfriend Dolores Fuller (Sarah Jessica Parker) is done as a do-or-die moment of self-revelation; later, after Dolores leaves him, Wood reveals his fetish to his new girlfriend, Kathy O’Hara (Patricia Arquette) in a stalled funhouse. The setting has the cartoonishness of most of Burton’s efforts at creepiness, giving us a feel for the funhouse origins of his sense of style. Kathy has no problem with Wood’s tendencies and they live happily ever after as a couple. As a director, Wood finds himself up against one set-back after another. His doggedness is inspiring in some ways—and some of his efforts recall those of John Waters, another cult director with a love of the kitschy, the trashy, the garish and the weird. 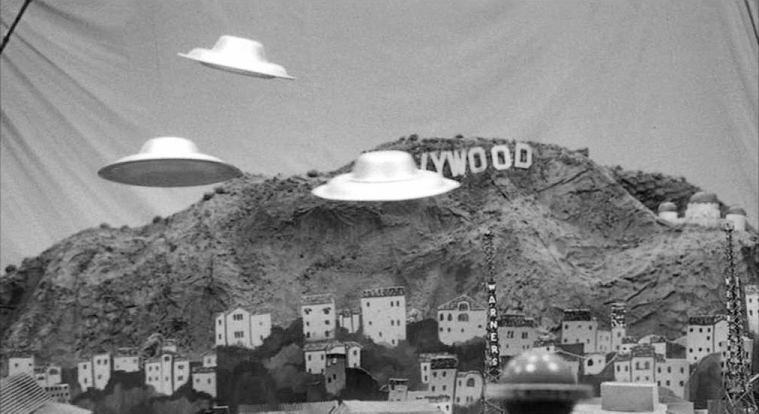 Wood, in real life, never attained the skill of Waters, but, for the purposes of Ed Wood, we can almost pretend he did. 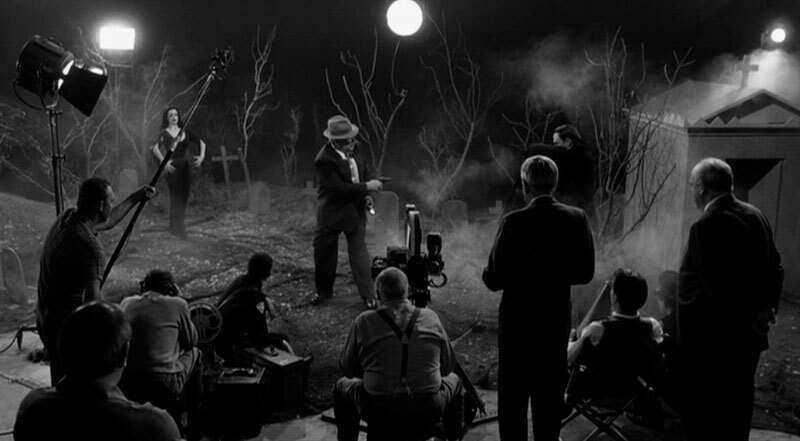 The screenwriters give Wood a great scene during the filming of Plan 9: Wood, annoyed with the intrusions of his financial backers, stalks off the set and goes to a bar. Who should be slumped in a booth but Orson Welles himself! Played with an earnest scowl and a dubbed voice by Vincent Donofrio, Welles bucks Wood up by telling him of the problems he faces in making his own films. It’s a moment of savvy film awareness. Welles, generally hailed as a genius as a film-maker, faced all kinds of difficulties and disasters in getting money for his projects and in bringing them off according to his intentions. The film industry, we see, is a hurdle for the driven originals in the field, for the likes of visionaries like Welles and Wood! As wry as that little jab is, there is great affection behind it too—and both sentiments inspire the portrayal of Béla Lugosi, an Oscar-winning role for Martin Landau (the make-up for the role also earned Rick Baker and his team Oscars as well). Lugosi is depicted as in his last gasps as an actor, struggling with a morphine habit and reduced to the dire straits that many has-beens find at the end of their time. Lugosi was an international icon thanks to his performance in Tod Browning’s Dracula, but most of his films are B-level horror and suspense fodder. Burton’s film gets a bit edgy in its depiction of the depths to which Lugosi has sunk (which is mostly fictional but which gives the film much of its darkness), and what’s remarkable is how comic and warm the scenes with Lugosi manage to be: Landau infuses toughness, egotism, pathos, professionalism, friendliness, scariness, and a very human humor into his Lugosi. It’s truly a remarkable portrayal and sets the standard of the film To be good enough to accommodate Landau’s Lugosi, the film has to be very good, and it is. The interplay between Depp and Landau carries much of the film, but there are many great supporting roles: Sarah Jessica Parker is suitably brittle as the long-suffering Dolores, dumped from a prime role because a supposed backer wants to play the part; Patricia Arquette is soulful and devoted as Kathy; Bill Murray is a far cry from his glib wise-guy roles as Bunny Breckenridge, a sad-sack queer who helps Ed find transvestites for Glen or Glenda and then plays “the Leader” in Plan 9; Jeffrey Jones, one of Burton’s recurring character actors, plays the charismatic Criswell, a supposed psychic who provided voice-overs for some of Wood’s films (Wood often shot with no sound or used stock footage)—Jones memorably opens the film in a coffin, giving a mock warning to viewers about the shocking nature of the film they’re about to see. With atmosphere a-plenty, including great set work to create a B-movie version of Hollywood, and great fun showing the rigors, the compromises, the bathos and the camaraderie of film-making, with a sympathetic glimpse of the difficult task of causing suspended disbelief (especially with the money men), and with odd and memorable characters, especially an indelible portrayal of an aged and ailing old movie star fallen into the dregs of movie-making, Ed Wood is one of Tim Burton’s least successful films (in box office returns) and one of his best. That’s largely because of the quality of the writing here, something Burton seems not to care about much once he becomes an enormous box office draw. The film makes a point, in the context of films of the Nineties: the schlock of Wood’s films is in part due to lack of professionals and lack of budget; the high-grossing schlock that tops the charts in the Nineties and after, which are largely little more than B-movies with budgets and know-how—and Burton is among the culprits—has no such excuse. Labels: 1990s, 50 Films Since 1970, analysis, favorite movies, film-viewing, movies, Whatcha Watchin?